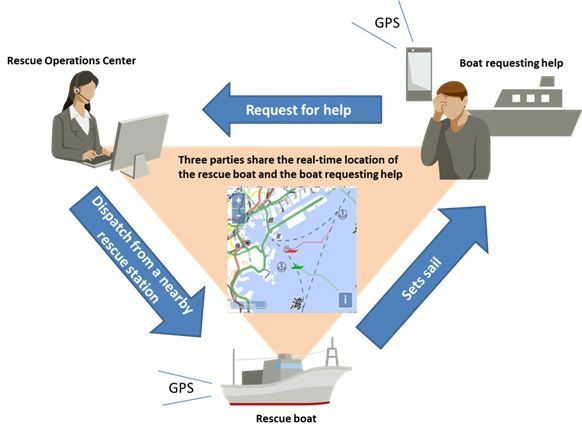 The Japan Marine Recreation Association (JMRA) and Fujitsu Limited today announced the deployment of a cloud-based emergency position reporting system developed by Fujitsu for JMRA's pleasure boat rescue service, the Boat Assistance Network (BAN). The service will be offered beginning in the fall of 2017. 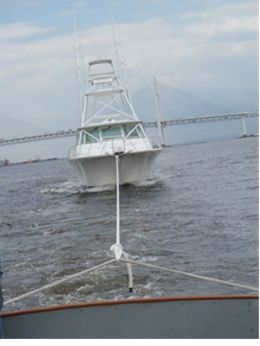 When pleasure boats run into mechanical problems or other difficulties, owners can simply access the online emergency position reporting system from their smartphone or other internet-enabled mobile device, and automatically transmit the correct position of their craft to JMRA using a GPS information service. 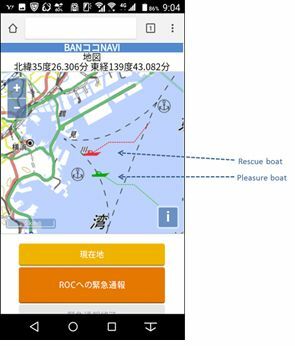 Through GPS coordinates and an automatically updated map, the rescue ship can obtain constant positional information of the help-seeking pleasure boat as it is carried along by currents and tides, to quickly reach the rescue location. Those who requested help can also get real-time map updates on the position of the rescue boat, giving them peace of mind while they wait for assistance. JMRA will support increased safety for pleasure craft operation using Fujitsu's cloud-based emergency position reporting system, which can be easily operated from smartphones and other mobile devices. In 2016, there were as many as 1,300 pleasure craft boat incidents in Japanese waters, of which about 850, or roughly 65%, needed help with relatively minor problems such as equipment failure, dead batteries, or fuel outage. JMRA operates a variety of businesses relating to marine leisure including BAN rescue services that are offered 24/7 to pleasure boat owners who have run into minor troubles. Since July 1992, BAN has helped over 400 boats per year (445 in 2016), contributing to safe marine recreation. When pleasure crafts encountered problems, there were often challenges in confirming their location. Due to the lack of reference points on the sea, and as tides and currents can carry vessels away, those requesting help had difficulties conveying their position to BAN's Rescue Operations Center. Therefore, there was a demand for a system that could enable more efficient, rapid rescues. This system enables both the Rescue Operations Center and the rescue boats they dispatch to continually know the accurate position of those requesting help through GPS coordinates and an automatically generated map. As a result, rescuers can reach the location more quickly using the GPS information from their smartphones or other mobile devices. Because the system can share the real-time position of the rescue boat on the phones of those who request help, they can wait for rescue with peace of mind. Furthermore, the Rescue Operations Center, the rescue boat and the craft requesting assistance can all see the movements of the boats on the same map, significantly reducing time until the rescue and preventing the risks of secondary accidents such as collisions that occur while the craft drifts. The service can be used both by smartphones and internet-enabled mobile phones. In case of trouble, one can easily access the emergency position reporting system on the internet, generating an urgent report to the Rescue Operations Center while transmitting necessary information including location and contact details. This will enable those requesting rescue to calmly respond to the problem and accurately convey their position, which would otherwise be difficult to determine as it may change with the current. JMRA will further expand BAN, contributing to a safer and enriched marine recreation experience. Fujitsu will ensure the stable operation of this cloud-based system and continue to develop new services and information databases to support safe ship voyages.